Explainer: What's happening in Libya and why is it important? The toppling of Muammar Gaddafi was just the beginning. OVER 30,000 PEOPLE have died in the violence that swept Libya since the start of 2011. The country saw dictator Muammar Gaddafi, who had led the country since 1969, ousted and killed by rebels. However, when the country elected a new government in 2012, it did not mark the end of tensions. Libya has since slid into a second civil war. Two weeks ago, Libyan militants released a video in which they beheaded 21 Coptic Christians from neighbouring Egypt. The video shows the militants claiming to be members of the Islamic State. But how has Libya gotten this far? Why did 2012 not lead to peace? In 2011, during the height of the Arab Spring, Libyans rose up against Gaddafi’s dictatorship. Unemployment was high, social conditions poor and intimidation and summary executions rife. Rebels, backed by a NATO campaign, captured Gaddafi and killed him on camera. NATO considered this a success. Because a dictator being overthrown in an unstable Arab country has never turned into a disastrous power vacuum before. A transitional government was installed and historic elections held in 2012. NATO would continue to provide air support, but civil war engulfed the nation of around 6 million. The reason for this was that the rebels who overthrew Gaddafi were an exceptionally disparate group whose only common goal was removing Gaddafi. The new government would try to rein them in, but would ultimately fail. Some would be brought under the Libyan Defence Ministry, whose control was weak. Some of these militias would protect the American mission in Benghazi, but others wanted a strict version of Sharia Law enforced. There are some that want a state supported by the Quran. In 2012, four Americans were killed in an attack on the American mission in Benghazi. This alerted the US that the transition would be difficult. A year ago, one of Gaddafi’s former generals, Khalifa Haftar, launched Operation Dignity. Hafar had gone into hiding in the US in 1990 following the Libyan war with Chad. In 1996, he had taken part in a failed uprising against Gaddafi. He returned in 2011 to support the overthrow of his former boss. He claimed to be targeting Islamic groups who he believed had taken over the Libyan parliament. Haftar held a press conference claiming that the Libyan parliament was no longer serving the people and his forces attacked militias in and around Benghazi. Around 70 people died and the Libyan government denounced the attacks as illegal. Haftar would continue however, attacking the capital of Tripoli, forcing parliament to flee and almost destroying it. This time, however, Haftar found support from members of parliament, the heads of the navy, special forces and air force, as well as some of the army. Militias were split on supporting the operation, with some deserting and some siding with Haftar. 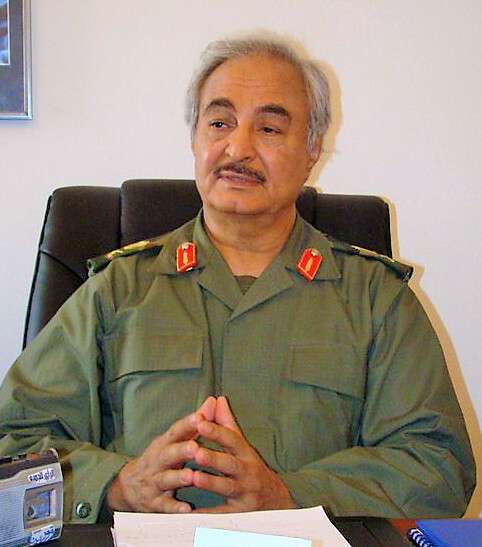 Haftar’s moves were supported by tens of thousands of people on the streets and would eventually force the Libyan House of Representatives to side with him. Since then, Islamist forces calling themselves Libya Dawn have battled with forces across the oil-rich nation. Egypt and the UAE intervened, supporting the Libyan government with airstrikes on Libya Dawn targets. Because Libya is so big and the population concentrated along the northern coast, there is huge swathes of contested land. That is where ISIS comes in. In autumn, the city of Derna, 330 kilometres from Egypt, was claimed by Islamic State. Then, last week, the group released the video showing the murder of 21 Christians. That led to 15,000 Egyptians leaving Libya and Egyptian forces bombing targets in Libya. The fighting is intense and the country is chaotic. There is no overstating the chaos of post-Qaddafi Libya. Two competing governments claim legitimacy. Armed militias roam the streets. The electricity is frequently out of service, and most business is at a standstill; revenues from oil, the country’s greatest asset, have dwindled by more than ninety per cent. Some three thousand people have been killed by fighting in the past year, and nearly a third of the country’s population has fled across the border to Tunisia. What has followed the downfall of a tyrant-a downfall encouraged by NATO air strikes-is the tyranny of a dangerous and pervasive instability. Over one-third of the country has fled and peace talks held in January failed. The situation is an alarming one for Europe. With Libya just miles from 200 miles from Crete, European leaders could have to face an Islamic State threat on their doorstep. Email “Explainer: What's happening in Libya and why is it important?”. Feedback on “Explainer: What's happening in Libya and why is it important?”.